From August 25 to September 6, the campus celebrated its longstanding Welcome Week tradition to usher in the start of a new academic school year. Coordinated by the Undergraduate Student Government, the week-long event offered students a chance to ease into a new semester. The celebration included picnics, ice cream socials and club fairs. The event’s annual club fair drew large crowds to the main cafeteria on the third floor of its West Building, which normally seats up to 250 people. Students and staff either gathered to learn more about its various clubs and organizations or they participated in the event by promoting and representing different clubs on campus. Douglas Paillere, an advisor within the Office of Diversity and Compliance, represented the InterVarsity Christian Fellowship, a nationwide campus ministry focusing on community building, service projects and bible study. The organization wants to “create a safe environment” where students can build partnerships and give back to their communities, said Paillere. Established in 1941 with the formation of its first chapter in the United States, it now has 1,011 chapters, can be found across 667 college campuses, and has over 40,000 members, according to the organization’s 2015-2016 annual report found on its website. Hunter’s chapter was chartered in the fall of 2014. Sporting a bright blue InterVarsity shirt and khaki pants, Paillere handed out fliers, hoping to spark student interest and amass signatures for the organization’s signup sheet. “Our goal is to reach 1500 in five weeks,” said Paillere. The organization used candy strategically placed next to the sheet in order to entice students to visit its table. As Paillere engaged students on one side of the cafeteria, Mike Mazzeo, 22, did the same on another. 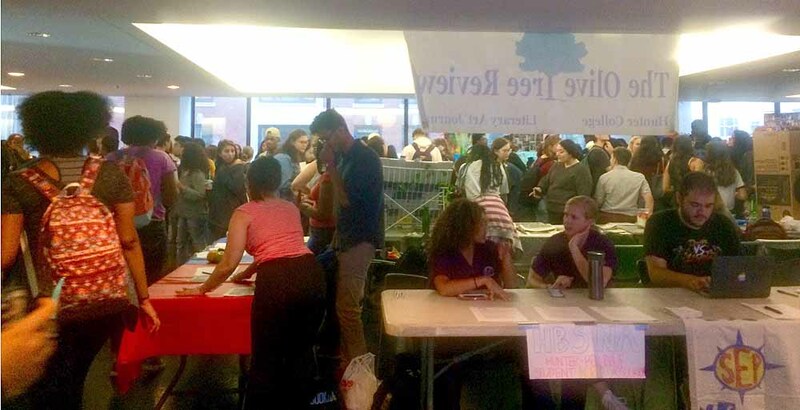 Mazzeo, a senior living in Brooklyn and majoring in biochemistry and minoring in human rights, spent his time at the club fair recruiting students for the Peer Health Exchange, a nationwide organization whose mission is health education. Founded in 2004 in New York City, students who join are trained to teach a comprehensive health curriculum in low-income high schools, with a particular focus on educating incoming freshmen. As one of its college partners, Hunter’s chapter has been recruiting students since 2014. Mazzeo, whose passion for community service and health education began with a medical service trip to Nicaragua in August 2015, strives to “push for education equity and improve health,” he said. In Nicaragua, Mazzeo engaged local residents to provide “much-needed medical care to an impoverished community” in the form of discussions about public health, sanitation, and medicine, he added. Mazzeo joined Hunter’s chapter shortly after his trip, becoming its director of Spanish education for the next six months. Upon joining, he was given a dark grey shirt branded with the organization’s bright orange logo, which he paired with jeans as he handed out fliers at the club fair. “I recognized the value of education in medicine, and how knowledge is used to empower individuals,” said Mazzeo of his trip. Hunter is a commuter school and events such as the club fair can give students like Mazzeo a sense of “community,” he said. The main campus at 68th Street and Lexington Avenue is comprised of three towering buildings that are connected by sky ways, making it easier for students, faculty, staff and visitors to move between the North, West and East buildings. With 16,550 undergraduate students enrolled as of 2015, according to statistics taken from the college’s website, 61 percent of those students are state residents. The campus is often bustling with students making their way quickly in and out. Jeffrey Reyes, 22, a transfer student from Long Island, echoed Mazzeo’s sentiment. “At Hunter, I feel like I have a place, like I have somewhere I belong, with people who want to make a change in the world,” said Reyes, a senior majoring in history and double minoring in psychology and public policy. While Reyes said he has always been interested in politics, his beliefs in political radicalism can be traced back to the 2016 Presidential Election. He said he has found a place on campus among fellow student activists. While handing out fliers for his club, the Student Empowerment Project, he sported black jeans and a bright yellow T-shirt from a recent march with the Bronx Coalition for a Community Vision, formed in 2014 in reaction to the city’s plans to rezone a local neighborhood in the Bronx. The Student Empowerment Project, as described on its official Facebook page, is an “organization dedicated to combating all forms of oppression, especially those that affect students in the Hunter College!” The club, which originally formed last semester at Queens College, established its own presence in the Hunter community this summer, with an agenda adapted to the interests and needs of students at Hunter. Currently on its agenda? Reform of the College Association Board. Monet Hicks, 19, a transfer student, attended the Welcome Week club fair to find a niche. Originally hoping to join a Korean pop music club, stemming from her desire to direct music videos like those of its genre, her love of Vice magazine caused her to bee line to Cult. Magazine, a student-run publication dedicated to culture and showcasing the talents of its diverse membership, whether it be writing, photography or fashion. Although Hicks, a sophomore, is new to the community, having spent her freshman year at the College of Saint Rose in Albany, she said she planned to take advantage of all that Hunter has to offer. Including tuition, fees, and room and board, expenses at her former college were just over $44,000, according to data listed on the college’s website. The mounting tuition resulting from the school’s debt caused Hicks to transfer, a decision she said she was happy with as she commutes easily to Hunter from her home in Fresh Meadows, Queens. “I’m getting a good education,” said Hicks, wearing a backpack and purple sweater as she exited the club fair, hugging fliers and magazines to her chest. “I like Hunter way better.” Currently undeclared but excited to explore her interests in media studies, she said she looked forward to dabbling in music and theater classes in the future.